Producer/mixer Taylor Larson (Asking Alexandria, I See Stars, Periphery, and Within Temptation) and youtube star/session drummer Luke Holland (Independent, Jason Richardson, The Word Alive) have teamed up to bring you their best one shot drum samples from all of their years working together. This all-star duo has built a well-deserved reputation in the music industry for their massive drum sounds transcending many different genres of music. Taylor and Luke’s Drumshotz pack features many powerful and versatile sounds which will inject excitement into your mixes. 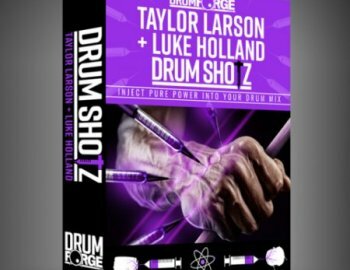 Mix and match your favorite sample libraries or raw drum recordings with the Taylor Larson + Luke Holland signature DRUMSHOTZ today and discover a fresh take on your sound. One-shot signature drum sample collection from producer Taylor Larson with drummer Luke Holland. 34 samples total in 44.1, 24 bit format.